Rust modificator – for treatment of rusty ferrous metal surfaces before their priming and painting. The effect of the product is optimal if thickness of the rust layer does not exceed 100 microns. It is recommendable to any user who prepares ferrous metal products before painting for cleaning of the ferrous metal surfaces from the rust layer. 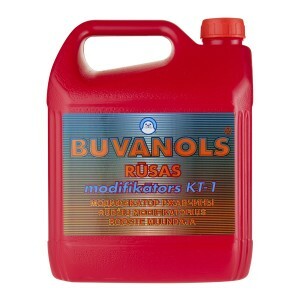 Buvanol not only chemically modifies the rust layer, but also hampers formation of a new rust layer. Unconsolidated rust layer should clean mechanically. Use the product according to instructions on the packing.